A long time ago I told a reader I would review this pencil, and then didn’t. So, it’s been a long time coming, but finally we are here. On the Pentel USA website, the Sharplet-2 is available in 0.5, 0.7 and 0.9mm lead sizes, but there is no choice of colours. Mine is the 0.5mm lead, thus it is an A125, not an A127 or A129. The Sharplet-2 is clearly a fairly plain simple design, and you might expect it to be an economy range or price-fighter model. However, Pentel price it well above quite a few of their other pencils so clearly they do not think of it that way. So that’s something to bear in mind during the review. The main body is a simple round tube. At the lower end there is a series of concentric grooved rings to create a grip zone. They are quite successful and provide a good grip. Of course being a plain round body you can easily hold the pencil anywhere you want to along its length. One hint about the non-economy nature of the Sharplet-2 is that the body is quite rigid. There is very little flex under even quite heavy pressure – far less than many other pencils. The front tip section is a smooth plain tapering cone. It is screwed onto the body. There are some interesting marks moulded into the top of the cone section which look like they might be designed for grip when the tip is being automatically screwed onto the body by some machine. Hopefully you can see all this in the photo below. These innards all look a step above the economy grade. The tip finishes with a short thin round metal lead sleeve. It is only about 2mm long so not really suitable for draughting (or drafting). As is common with so many Pentels it is a fixed sleeve and thus not pocket safe. The Sharplet-2 is definitely a lightweight pencil, so balance is basically unimportant. It is also a reasonably narrow pencil and thus not suitable for those who like a bigger or heavier pencil. The Sharplet-2 is more for those who don’t like to be reminded that their pencil is in their hand. Up at the top end of the pencil we have a black cap. No surprise that you push on it to get lead out the other end, or that you pull it off to reveal a small eraser, which in turn pulls out to allow the lead magazine to be refilled. The black cap is a friction fit onto the white tubing, and I can see it being lost over time. 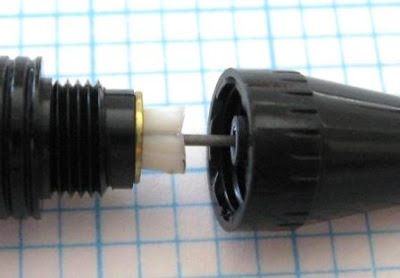 Ten clicks on the cap will get you about 5mm of 0.5mm lead, which is a small amount for a general writing pencil. The Pentel website notes the Sharplet-2 features an ‘adjustable metal pocket clip’ but doesn’t give any information on this adjustability. In the absence of instructions I’m left to draw my own conclusions. So, it appears the adjustability is that as the body is smooth and round and the metal clip is just friction fitted on, you can slide the pocket clip up and down the body to your desired position, or you could slide it right off the top and remove it. Personally I like it just where it is, up at the top of the barrel. I don’t like it when my pencil rolls around on my desk so a pocket clip is always a welcome anti-roll device to me. Like most Pentels, the marking on the pencil is fairly extensive – name, model number, lead size, etc. Overall then, the Sharplet-2 is quite a nice pencil. Plain but honest. In some respects it seems like it’s a cheaper general writing ‘little brother’ version of the P205. Best Points – The grip zone is quite effective. Not So Good Points – Mechanism should advance more lead per click. Does this pencil make it into the Top 5? – Good question. I’ll have to go through the existing Top 5 one by one to decide. So, does it deserve to replace the Pentel Energize? Definitely not. 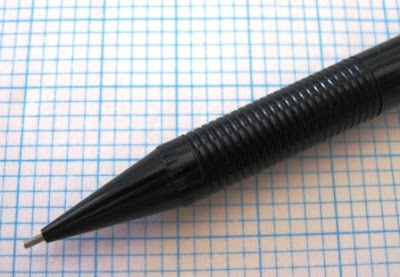 The Pentel Technica-X? No. The Staedtler Graphite 777? Umm….No. The Pentel Techniclic? Ahhhhhh….Maybe. The Staedtler Tri-Plus Micro? Definitely not. The problem is, the Sharplet-2 is rather plain, dare I say ordinary, and surely the Top 5 is for the extraordinary? On that basis, the Techniclic has that little something extra, and so it’s a mighty close call but the Techniclic stays in the Top 5, and there is no room for the Sharplet-2. I don’t think I’m being paid enough to make these sort of hard decisions. Dimensions – Length 141mm, diameter 8mm. Balance point about 75mm up from the tip. An interesting review but I prefer to think of Pentel's P225 Pro/Am as the general writing ‘little brother’ version of the P205. In any case.....how about a review of the P225? I'm sure the P205 has a few brithers. Well, I'll put the P225 on the list, but it took the Sharplet-2 over a year to get to the top of the list. Still, hopefully I'll be quicker this time. Well nice balanced review - i imagine it is a bit hard to review a pencil so simple but thats what I like about it - clean lines, simplicity, honest, well made no gimmicks. I think you should reserve one place in your top five for a reserved style - like this. They can be quite attractive lined up http://pencils11.blogspot.com/2009/02/finally-i-have-decent-amount-of-cases.html- 2nd last photo in first article. One final thing missing from your review - the white patch between the barrell and the eraser cap is a nice contrast to the single colour of the pencil. Germ - in the Oz market we can only get the 0.5 Sharplet-2 in four colours - Turquoise, Green, Black,and Yellow with red lettering. The 0.3mm Red model is not sold down under. It was your photo that started my fascination with these pencils. On a general note I dont know whether it is the pencil or the lead (standard Hi-polymer) but they write with a lovely crispness that I don't get from some of my more expensive pentels. This was my favorite pencil, until i got a pentel energize. I really like the high quality and low cost of this pencil. Have you seen the Pentel Sharplet Fine A225 capped pencil? With (sic) "Rubber finger grip for control and comfort?" Hi PointFour - no, hadn't seen the A225. Or maybe I did ages ago and forgot. Thanks for pointing it out. I have always been surprised that these last as well as they do. When I first saw the plastic clutch they use, I figured it would break after very little use. Of note is that a standard arrowhead pink eraser cap is a perfect fit on top of the Sharplet-2. 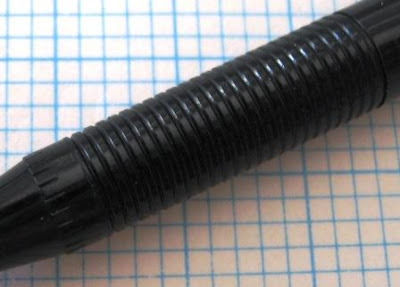 Some other pencils are either too small or large in diameter, or the button on top is too short to fit an eraser cap. Being a frequent eraser, the little under-the-cap erasers are useless to me, but I also cannot be troubled to carry around a separate eraser, so the ability to fit an eraser cap is a must for me. Do you know if they ever made refill erasers in that green color? These are very good pencils based on personal experience using them. Over the years I have had them in black, violet and yellow. could you do a review of the pentel pg5? the one that is on your top 10 drafting pencils list? This site has induced me into a mechanical-pencil buying bender, and I am pleasantly surprised at how nice this pencil is. The build quality is not as nice as some others, but it feels very nice in my hand and writes well. Dave said in his review: "The Sharplet-2 is more for those who don’t like to be reminded that their pencil is in their hand." In my mind, that is exactly what a pencil should be. The best thing about the Sharplet-2 is that the pocket clip is removable - simply by sliding upwards and off the top. This pencil is then even more comfortable to use because the clip does not cause any obstruction to the hand. Great review, Dave! I have this pencil but in white. I have used for drawing this model mechanical pencil since the early 80's. My first one was a turqoise color and as a kid it was my most prized posession. When I lost it in highscool in 1992 my whole world fell apart. I have been trying to find one of the same color ever since. I have since bought the black and lavender in fear they might soon be discontinued by Pentel. To me this specific design is legendary. I would buy them in every possible color but do not see them arround issued in any other color but the two I mentioned. Do you know of an available source that sells them in turqoise? Great review. Forgot to mention the turqoise Pentel pencil may have been a A125 SHARPLET first generation not a SHARPLET2. I think the difference in the two was no perforations on top of the cap of the first generation. The 2 has four openings on the cap possibly for air escapement for easier pump action. I hope to find a turqoise one in the future. I got the white one, and I've seen a greenish-grey one. I think the sharplet-2 is great for drawing and sketching because of the lightness for maneuvers. Small and lightweight, almost like wooden pencil. Only sharp. Huge plus for me. Due to good comments found on the Sharplet, I went looking for it. All I found was China-made versions, which made me think twice. Instead, decided on the 120A3dx, another great feeling pencil. Also the looks is a plus to me. 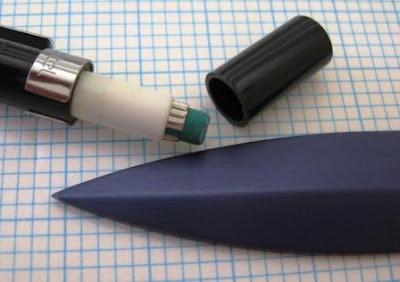 About the name "Sharplet", could it be the intention of Pentel of making it sort of a lesser brother of the "Sharp" P200's ? Thanks for the site, very informative. Poll 7 - Where Are You?